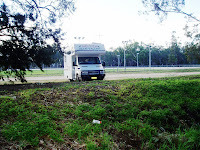 Behind the Nyah Harness Club on the riverbank is a level, well shaded camping area where, if you are fortunate enough, you will have a ringside seat to some pacers doing whatever pacers do by floodlight for about an hour or so on Wednesday night. 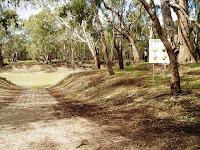 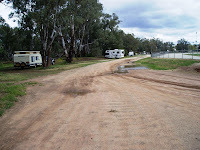 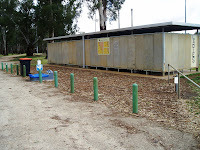 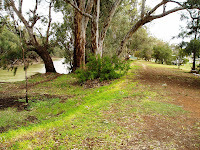 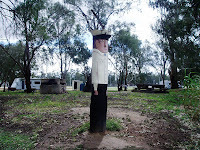 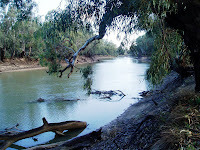 The camping area is on the river bank and there are large, level, grassy sites near a boat ramp. 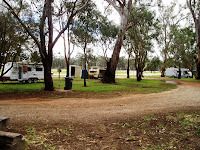 On the town side of the track is a large area nearer to the toilets, fresh water and a dump point which is also suitable for camping. 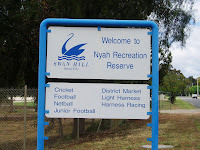 Nyah is a RV Friendly town and shops are located on the main highway or a larger selection at West Nyah about 2k from the Highway.